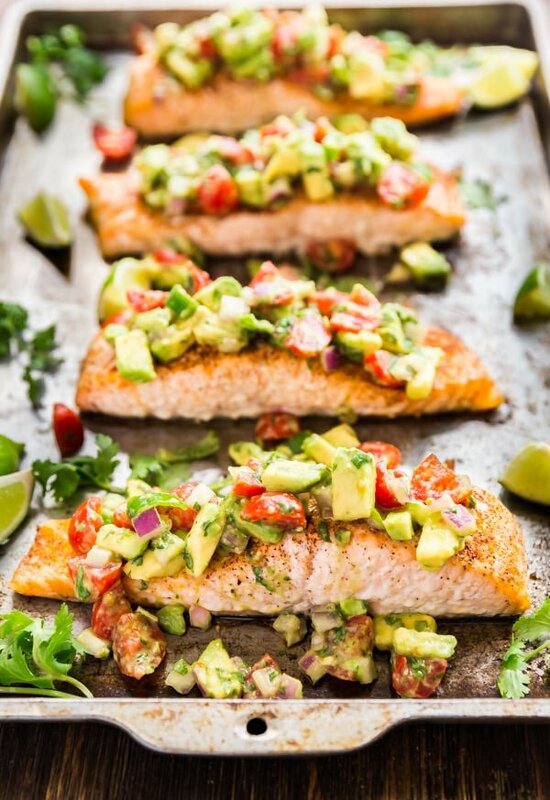 Chili Lime Baked Salmon with Chunky Avocado Salsa is the perfect light and healthy dinner for a weeknight! 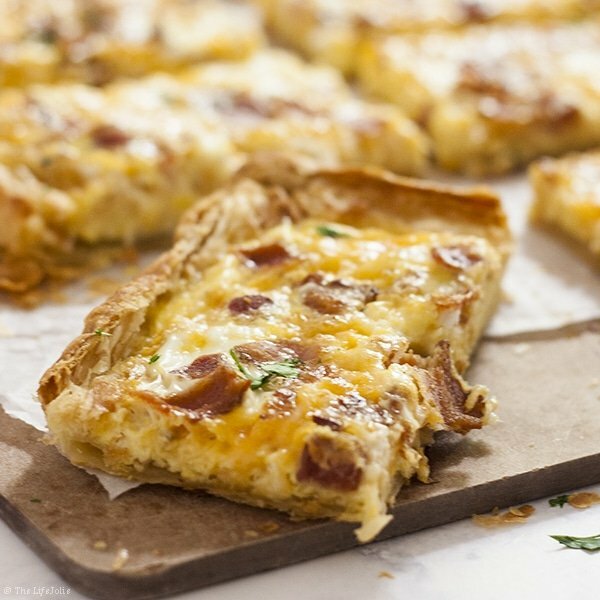 Made with fresh, simple ingredients and tons of flavor that the whole family will love! This baked salmon recipe was another one of those rare moments that I threw together a bunch of what we had on hand and pure magic happened. It also meant that the recipe testing phase was fun because it was so darn delicious and perfect every single time. Winner, winner, Salmon dinner! I feel like this dish totally represents some of the best flavors of summer. The best possible word to describe it is fresh. It’s super light, making it perfect for a hot summer night (or day). It comes together pretty quickly which earned it a nice spot in our weeknight dinner rotation. And it’s seriously gorgeous and has that “wow-factor” that also makes it a great options for a summer dinner party. I find cooking salmon in the oven to be the most simple route, but you can also totally grill your salmon if you don’t want to bother turning on your oven. There’s nothing like a good baked salmon filet! First things first, take the fish out of the fridge before even turning on your oven. This allows it a little extra time to get closer to room temperature. Make sure to spray your pan with olive oil cooking spray to prevent sticking. Or better yet, line it with a Silpat or parchment for easier clean up. I left the amounts of seasoning open so that you could do it to your taste. Make sure you squeeze on the lime juice first so you don’t wash away all those great seasonings (I used 1/2 of a lime and then used the other half plus another whole lime to get juice for the Chunky Avocado Salsa that goes on tops of the fish. Bake the fish for around 18 minutes or until the internal temperature reaches 145 degrees. Squeeze a bit more lime over the finishes filets and spoon some of that awesome salsa over the top and dig in! Preheat the oven to 400 degrees and spray pan with cooking spray. 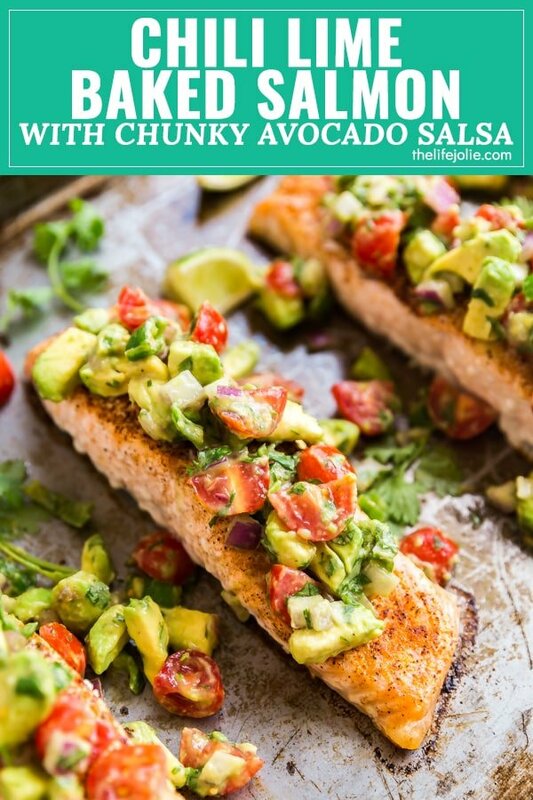 Place salmon filets onto the pan and squeeze the juice from the half lime onto the salmon. Season the fish to taste with salt, pepper, garlic powder, cumin and chili powder. Bake for 15-20 minutes or until they reach an internal temperature of 145 degrees. 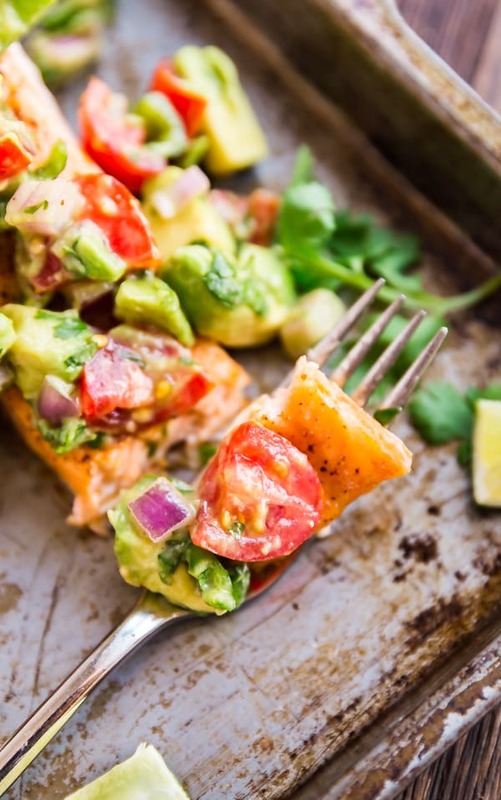 Top with Chunky Avocado Salsa and serve immediately. 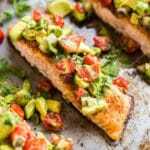 Looking for some other great salmon recipes?